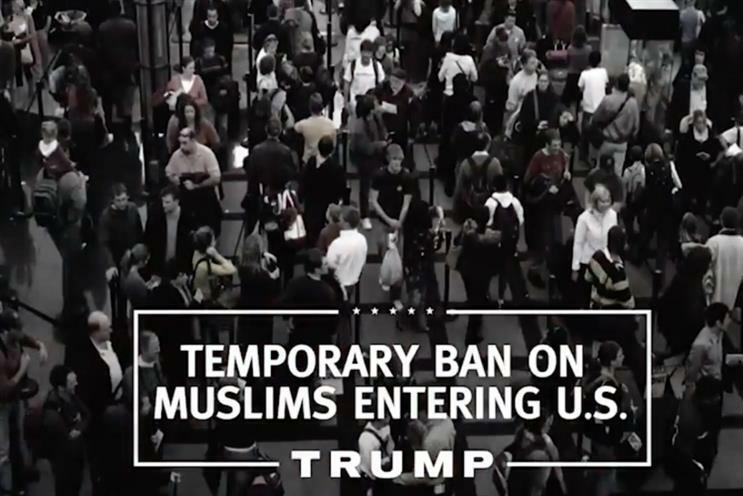 Donald Trump's first campaign television ad repeats his controversial assertion that Muslims should be prevented from entering the United States. Trump is spending at least $2m a week on media spend as he seeks to win the race to become the Republican party's presidential candidate. He is allocating $1.1m to Iowa and almost $1m to New Hampshire, which are among the first states to vote. In the ‘Make America Great Again’ campaign ad the voiceover states Trump is seeking a "temporary shut down of Muslims entering the United States until we can figure out what is going on". The statement is made after showing the images of Syed Rizwan Farook and Tashfeen Malik, the perpetrators of the San Bernardino mass shooting. Following the shootings Trump called for a temporary ban on Muslims from entering the United States. Al Qaeda affiliate al-Shabaab has reportedly used Trump's comments in a recruitment video that portrays the US is anti-Muslim. Trump said: "We have tremendous crowds, incredible support from all over the country and I am $35m dollars under budget. "We have spent the least amount of money and have the best results and this is the kind of thinking the country needs. I am very proud of this ad, I don’t know if I need it, but I don’t want to take any chances because if I win we are going to Make America Great Again." The TV ad also highlights his pledge to build a wall on the United States’ southern border "that Mexico will pay for" to keep illegal immigrants out the country. The creative also shows imagery of airstrikes alongside the claim that Trump will "quickly cut the head off ISIS and take their oil". Trump has already run radio ads in the first three primary states and will launch a new radio ad this week featuring Kathryn Gates-Skipper, the first female Marine to serve in combat operations. Gates-Skipper endorsed Trump at his Sarasota rally in November. A further radio ad will feature Nancy Mace, the first female graduate of South Carolina military college The Citadel.